PARENTS, it is said, can mess up your life. The poet Philip Larkin famously said something along the same lines, but in more blunt language. I thought about this recently in the very last place I expected to – the sequestered confines of a large Town Hall office. Opposite me, across the long polished table, sat the comfortable figure of Islington’s new chief ­executive, John Foster – broad face alert, searching eyes, a man used to being in charge. It was his life story that made me think of Philip Larkin. As it unfolded, I thought it would be difficult to find a rougher childhood. When his parents split up he was six – his mother had run off with a younger man, leaving his father, a skilled steel worker in Middlesbrough, to look after him. A few months later, the boyfriend of a baby sitter beat him up. Beaten up? You mean smacked a bit, I asked? “No, I was beaten with a strap,” said John. The six year-old must have been in a bad way because the social workers in Middlesbrough stepped in and put him in care. That’s where he stayed until the age of 18. He saw his father from time to time but his mother disappeared until one day he was called by an official at the St Bernardo’s orphanage and told his mother wanted to see him. He went into the principal’s office and saw a woman with another man. It was his mother, but he couldn’t recognise her. Somehow this man, who had such a rough upbringing, went on to take a degree in sociology and then began what turned out to be a successful career in the civil service. In the past 30 years he has been chief executive of Middlesbrough as well as Wakefield authorities. Somewhere in between, in the mid-1970s, he served on a special government committee. In those days, in the 1970s, John, now 59, wouldn’t have wanted to talk so freely about his ­early life – certainly not to a journalist whom he had just met. But culture and society have changed so dramatically over the years that people feel less awkward in talking openly about their personal lives. He spoke quite fondly about his parents. Whatever he may have blamed them for as he spent his years in the orphanage, all the sadness and anger appears to have evaporated. He could have cursed his parents and what life had thrown at him, but somehow he put all that behind him, compartmentalising his feelings until they were of little or no significance. You could just say, he simply got on with his life, and made of it what he could. You have also got to realise that he rose to Olympian positions in local government at a time when society was much more class-stratified, and people of his background hardly ever made it to the top. He must have done it simply through grit, determination – and intellectual ability. 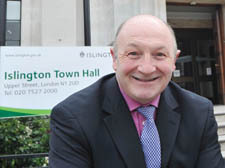 His appointment as chief executive of Islington is to the credit of the selection panel of Lib Dem and Labour councillors. He had only been in the job for six days when I met him on Tuesday afternoon, part of an exercise of meeting people – hence he had wanted to meet the local press. The evening before, he had – unusually so, for a chief executive – given a talk to the Labour group of Islington councillors. He wants to achieve something in what will probably be his last job before retiring from the civil service – or, as he prefers to put it, from public office. He talks about trying to put flesh on the aims of the council – to reduce ‘inequality’ in the borough, cut the pregnancy rates among young girls and persuade Turkish and Somalian men who are such heavy smokers to give up the habit. Six days into the job, he can only talk, understandably, in generalities. But I wasn’t thinking about that when I walked out of the Town Hall into the sunshine, but only of what had happened to this man, and how far he had travelled in life. IF the scouts dispensed badges for all Julian Fulbrook’s endeavours, it is quite possible we would not see the man for the merits. Fulbrook, who celebrates 30 years as Labour councillor for Holborn and Covent Garden ward on Saturday, is also a law lecturer at the London School of Economics and group scout leader for the 8th Holborn division. When the father of three is not fighting for a school south of the Euston Road or balancing the scales of justice, he is canoeing down canals or camping under the stars. It is fitting then that ­Fulbrook, who turns 60 this year and cites “certifiable insanity” as a prerequisite for Camden councillors, will not be having a normal anniversary. Before his Saturday evening shindig at the Knights Templar pub in Chancery Lane he will be running children’s activities throughout the afternoon at Coram’s Fields, ­Bloomsbury, to mark the Scouts’ 100th birthday. Why can’t we honour Daphne? I RANG writer Justine Picardie to find out what she thought of the sniffy reluctance of English Heritage to put up a plaque in Hampstead in honour of Daphne Du Maurier. I thought Justine’s opinion would be worth listening to because she has recently published a novel, Daphne, in which Du Maurier appears as the heroine. Justine, who lives in Highgate, is hosting a lunch at Burgh House tomorrow (Friday) where she will discuss Du Maurier’s life. English Heritage favour Du Maurier’s home in Cornwall for a plaque. “I can see why, because she is associated with the South-west,” Justine admits. “She did spend a great deal of her life there. But the Du Maurier’s are powerfully associated with Hampstead. I don’t see why they simply can’t put up two plaques – one in both places. “She wouldn’t have written the way she did if it wasn’t for her Hampstead childhood. And she revealed that Du Maurier holds a special place for her. TWO of our treasures, Alan Bennett and Michael Palin, have offered up their “scintillating conversation” to the highest bidder. Their offer comes in an auction due to take place at the Roundhouse tonight (Thursday). The Roundhouse Rock and Roll charity gala has brought out all of Camden’s great and good. Indeed, so long is the list of A-list attendees – including Alan Rickman, Alan Bennett, Terry Gilliam and Sadie Frost – it seems they will be fighting each other for elbow room at the glittering bash. Emma Thompson’s “lavender coat and handbag as worn on the red carpet” is to go under the hammer. Anthony Gormley, has donated a sculpture, while a signed gelatin print of Primrose Hill wild men of rock Noel and Liam Gallagher is also up for grabs. Roundhouse chairman Torquil Norman – who saved the great venue in the late 1990s – is offering anyone a spin in his 1940s Tiger Moth. A Ewan McGregor signed copy of an ­Othello script following his sell-out run at the Donmar Warehouse playhouse is also ­available. By my calculations The Roundhouse is almost guaranteed to raise the £1million they are dreaming about, for the many worthwhile youth projects they run.